I’m a huge sucker for behind-the-scenes movie and TV stuff. I’ve got books following the pre-production and production of films like Spider-Man 1 and 2, Batman Begins, and the first 3 Star Trek: The Next Generation feature films and a bunch of books on the production of the Star Trek TV series. This includes pre-production and production art, script and storyline development, and how they shoot the film or episode. No such book exists today for the new J.J. Abrams Star Trek movie unfortunately. Several key folks who worked on Star Trek have blogs and websites showcasing their work they did on the film. And let me tell you — this stuff is amazing. Beware — some of what is talked about below and in these articles may contain spoilers. Conceptual Illustrator James Clyne is now showcasing concept art he did for Star Trek on his site. A lot of his concept art focuses Nero’s ship the Narada (Nero is the film’s villian played by Eric Bana) which includes the very important drilling rig seen in the film as well. Click here to go through James’ Star Trek concept art. James also did concept art for Transformers, War of the Worlds, and X-Men 3: The Last Stand. James also helped with the designs of the U.S.S. Kelvin Bridge which was also the Bridge used for the Kobayashi Maru simulation. Neville Page is a Concept Designer that focuses mainly on character and creature design work. For Star Trek, he worked on the monster that chases Kirk on Delta Vega — affectionately known as “Big Red”. Click on Big Red below to see more of Big Red. TrekWeb also has an interview with Neville worth checking out too. Neville also did work on Cloverfield (which J.J. Abrams produced) as well as Watchmen. Ryan Church is another fantastic Concept Artist who worked on the new U.S.S. Enterprise for Star Trek. He essentially designed the new Enterprise — or (re)designed it. Either way — the new U.S.S. Enterprise rocks. Hands down — one of my favorite Enterprises to-date (the Enterprise-D still tops the chart). I have a huge request for Ryan (assuming Paramount let’s him) — let’s see more of the Enterprise! I want to see some better detail shots of the ship. More designs that you did. Ryan also did work for the upcoming Transformers sequel and James Cameron’s Avatar. One other thing for Ryan… could you please clear up the confusion regarding the size of the new Enterprise? Gizmodo is running with it being over 725 meters (over double of the Enterprise-A or “refit” Enterprise from the older movies). After watching Star Trek 4 times now and watching how everything looks in relation to the Enterprise such as Shuttles and windows (like the Bridge window on the top of the saucer) — I totally don’t buy that the new Enterprise is that big. Just doesn’t make sense to me. The International Cinematographers Guild has an article on Cinematographer Dan Mindel who did the cinematography for Star Trek. It’s a great article and offers up some insight behind the “lens flare” look they used for Star Trek (which I really liked). And CGSociety is running an extensive article on the CGI of Star Trek which was done mostly by ILM with Digital Domain stepping in for a few things. I also have to give a shout out to John Eaves who now has a super cool blog called Eavesdropping with Johnny where he showcases a lot of his work — with a lot of it coming from his past work on the Star Trek movies and TV shows. 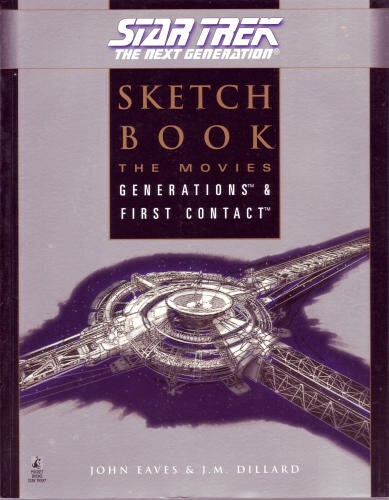 John was the author Star Trek: The Next Generation Sketchbook: The Movies — one of the books I mentioned in the first part of this post. It’s a really neat book and John did some excellent work especially for Star Trek: First Contact. Oh and shout out to Doug Drexler too! Sidenote: I think John Eaves did some work for the new Star Trek movie but I don’t think Doug Drexler did. I am giving these guys a shout out none-the-less because they rock in general and have great contributions to Star Trek regardless. The new Star Trek film was an amazing movie that truly reboots the Star Trek franchise for a new generation at the same time honoring what’s already been done in the Star Trek universe. I have to admit, I was extremely nervous about how this movie would turn out. But now I’m desperately awaiting the sequel. Next Post Am I a geek or a nerd?